3. Cut the butter into cubes. ** Using a pastry cutter or your fingertips, quickly cut or blend the cold butter into the dry mixture until it resembles coarse meal. 4. Using a large fork or wooden spoon, mix apricots and thyme into the flour-butter mixture. 5. Stir the cream into the flour-butter mixture with a large wooden spoon or a fork until the dough begins to come together. The flour should not be fully incorporated into the dough; do not overmix. 6. Transfer the dough and any loose floury bits to a floured countertop or pastry mat. 8. Shape the dough into a 3/4 inch thick round. Cut into 8 even triangles. Place the triangles on an ungreased cookie sheet. 10. 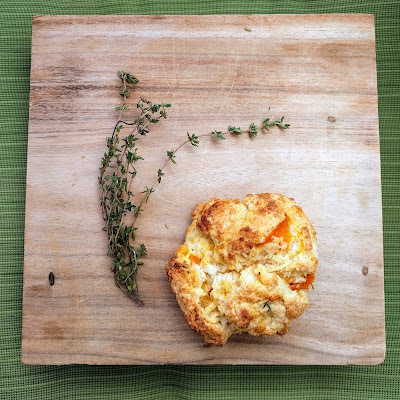 Bake 16-18 minutes, or until the tops are golden brown and a toothpick inserted in the center of the scone comes out clean. * If using fresh apricots decrease cream. Start by only using a cup a see where you are. 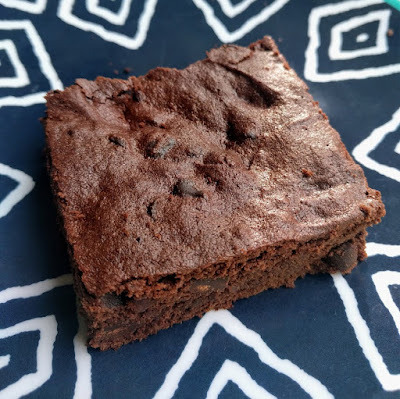 ** Ovenly directions say freeze before using but I just do this straight out of the fridge and into the dry ingredients and it works out fine. *** The worst thing to me is an overworked scone so I did not do this much mixing/kneading. I used my hands to mix and gather the dough, and formed drop scones for this batch rather than the triangles. I'm also not bothering with freezing the dough ten minutes, but I'm also not working it as much as they do. I once made my youngest sister a list of recommended memoirs. All of these are books I read and liked, and rated either 4 or 5 stars. This is originally from my ReadingEnvy blog, but I thought the readers of JennyBakes might be interested too! Half the story that went into the Julie and Julia movie, the blogger part. She is cleaned up and made into a nicer person in the film than she is in the book, but it’s very readable. She decides to cook her way through The Art of French Cooking by Julia Child and hijinks ensue. This is not alphabetical but it follows Julie & Julia so what can you do. This is a continuation of the story, but instead of her exploring Julia Child she works for a butcher. Also she cheats on her husband. I believe I mentioned she is unpleasant. Yet I gave it 4 stars because I couldn't stop reading it. Half the story that went into the Julie and Julia movie, the legend, the saint, the one and only Julia Child. This is the stage of her life where she is seeking for a hobby and learns to cook! I was surprised to feel like I learned so much more about Julia Child through her letters. The DeVotos are in the midst of the political and cultural action in New England while the Childs are moving between various appointed locations while Paul worked for the OSS. Julia was a staunch Democrat and very interested in politics, so many of the letters are full of discussions on what was going on with Eisenhower and McCarthy, up through the election of JFK. Seriously could this title be any longer. I love amateur chef memoirs and this is one of the best, plus it is also kind of a biography of Mario Batali. At this point, this book is just a restaurant worker classic, but I adore Tony. I read this when I first started thinking about restaurant work, and it was constantly referenced in the Limestone Grille kitchen. I’ve been watching Tony on television ever since. Funny because I remember this as a novel but it is a true story about being the child of immigrants and recreating community with foods. Light and lovely. All of this author’s novels are food related but this one is more personal, about her own childhood with different cultures and being a first-generation American. I LOVED this book so much I made recipes from it for Thanksgivukkah one year, and had my book club read it the next year. Not all of them loved it as much. It takes different decades of Soviet Russia and talks about her childhood through certain food items. I thought it was so interesting! Ruth Reichl was the longtime editor of Gourmet Magazine, and suddenly, Conde Nast cancelled the magazine right before the Thanksgiving issue. The next year of her life was rough, and she went back to cooking and spending time with family to make it through. This is where I got the apricot pie recipe, and even though it wasn’t great, it was how she wrote about it that made me want to try it in the first place. A graphic novel memoir. Easy read but fun. Learning to cook and falling in love, this is an behind closed doors story of Iranian culture! "A woman does well to be beautiful, mysterious, haunting, witty, rich, and exotic in bed... but it never hurts to cook good." From the old, pre-foodie era of New York City! Note: I do not think these are yet perfect, but this might be a recipe to start from. More of my notes below. We were cleaning out the flour cupboard (really just a cupboard that had accidentally become so!) and the quinoa flour was about to expire. I hadn't ever used it so poked around for recipes to try, landing on brownies. (Often with new flours, it's either pancakes or brownies I try first.) The cook who posted the recipe mentioned that chocolate helps cover up the bitterness of the quinoa flour, so I thought maybe that would be the best thing to try. These are pretty dry and dense. I should have at least baked them 5 minutes less. But this 9x9 pan has a stick of butter PLUS coconut oil so there is no reason for this dryness, unless the quinoa flour is just that dense. I'm pretty sure that's the culprit. But for those of us who only eat this kind of baked good, it might be worth trying. Perhaps it can be better enjoyed with low sugar ice cream. I took the recipe from Making Thyme for Health, who adapted it from another recipe. The recipe below is based on my own adaptation, so you may want to follow the rabbit trail. Start by preheating the oven to 350°F then line an 8 x 8” baking dish with parchment paper. Lightly spray with oil and set aside. Next melt the butter and the coconut oil together. Remove from heat and set aside. Using a spatula, stir in the sugar and maple syrup until well combined. Then add the cocoa powder, baking powder and salt and continue to stir until smooth. Add the two eggs and briskly stir with the spatula until the batter is thick and shiny. Then add the quinoa flour and continue to vigorously stir until the batter is smooth, for about 15 strokes. Lastly add 1/2 cup chocolate chips to the batter and fold together. Pour the batter into the lined baking dish, using the spatula to smooth it out along the edges. Bake in the oven for 25 minutes, or until you can prick a fork into the center and have it come out clean. * Allow to cool for at least an hour before eating. The longer they cool, the better they will hold together. *I wish I'd checked at 20! You should too. It is peach season in South Carolina! On July 4th, my husband and I went to Strawberry Hill USA to buy peaches. It is along a scenic highway, and is a nice drive from our house. They had several varieties but we went home with a bag of red globe peaches, which seemed sweetest. They are great for eating, sweet and easy to slice up, a freestone variety. Nathaniel sent me an email link to a recipe from TOWN Carolina with the subject line "Yum!" so I marked their recipe for Peach Blueberry Biscuit Cobbler to try. There are so many different varieties of cobblers and fruit dishes - this is a cobbler with full biscuits on top. I should have noted that in the photo on the web magazine, there is quite a bit of moisture. 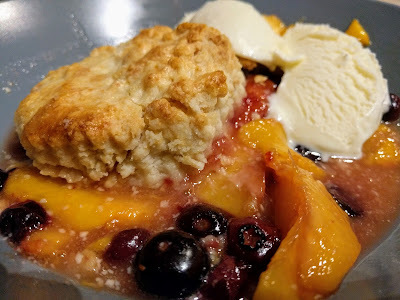 I never got this cobbler to the point I wanted it, and had to bake it 15-20 minutes longer than the recipe stated just to get the biscuits past raw. I wish I had cooked some of the moisture off first, but it is possible that if you are using peaches that are not as perfectly ripe and sweet, this will be less of a problem. But fair warning. 2. In a bowl, toss together peaches, blueberries, brown and white sugars, vanilla, lemon juice, and cornstarch. Pour into a 9-in. cast-iron skillet. 3. In a different bowl, mix together flour, sugar, baking powder, and salt. Cut butter into flour mixture, crumbling together until the butter is like sand. Add the heavy cream and stir together with a fork until the dough just comes together and forms a ball. You may need to add a splash or two more of cream to help the dough form. 4. Turn dough out onto a floured surface and gently pat into a smooth circle about 1-in. thick. Using a 3-in. biscuit cutter (or juice glass), cut 8 biscuits out and place on top of the fruit filling. 5. Brush each biscuit with cream and sprinkle the top with sugar. Bake for 30−35 minutes or until golden brown and baked through underneath. Serve cobbler warm with ice cream.